The ADVANCED Spectrometer System is capable for conducting a wide selection of spectroscopy experiments. This external unit interfaces through a USB port and features a 1024 channel MCA with internal preamplifier, computer controlled amplifier, high voltage (0-2048V), upper and lower level discriminators and Multichannel Scaling for half-life and decay studies. Also included is a Mossbauer interface and preamplifier power output (±12 V) for connecting detectors with external preamplifiers such as proportional counters and CdZnTe probes. 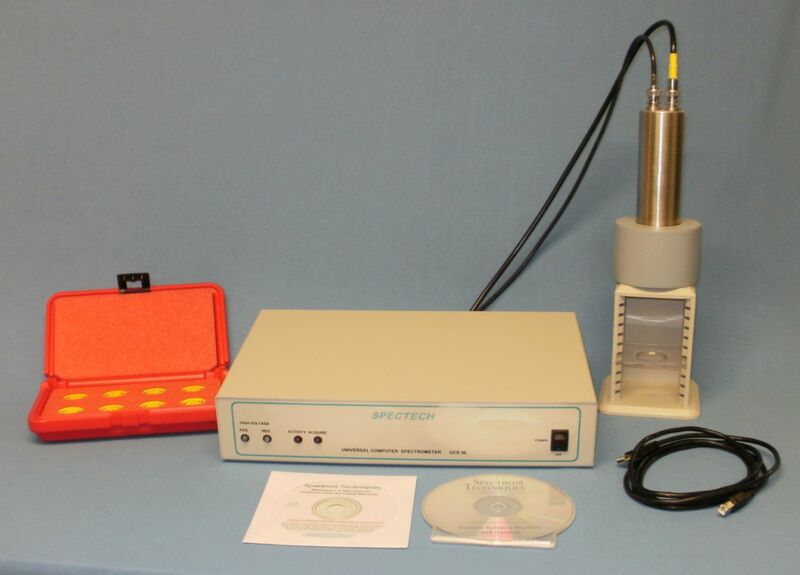 The complete system includes a NaI(Tl) scintillation detector with lead shield and multi-position sample stand, a set of 8 gamma emitting radioisotope sources with an “unknown”, MCA software with ISOMATCH peak identification and a lab manual of experiments in gamma spectroscopy on CD. USB connectivity provides plug and play operation with most of computers running Windows 2000, XP, or System 7/8 Software - in 32-bit and 64-bit versions. The set consists of Ba-133, Cd-109, Co-57, Co-60, Cs-137, Mn-54. Na-22 and Cs/Zn. Source activities are all 1 uCi, except the Cs which is 0.5 μCi and Zn which is 1 μCi Zn. The internal preamplifier allows direct connection to scintillation detectors. The bipolar amplifier includes polarity selection and multiple shaping times when using different types of detectors with external preamplifiers. Upper and lower level discriminators may be set for rejection of unwanted signals. The high voltage supply is rated to +2048V for use with scintillation or proportional detectors. Optional polarity selection is available for use with detectors requiring negative bias. A preamplifier power connector (±12V) is included for use with our model PA-1 external preamplifier. A 10µsec fixed conversion ADC allows high throughput with dead time correction. Input selection for preamplifier, amplifier or ADC direct is included by computer control. In addition to the normal pulse height analysis mode the UCS30 may be operated as a Multichannel Scaler for time correlated studies such as half-life decay. A special Mossbauer mode is included with MSB output for synchronization of the drive circuit. X-ray mapping may be performed with the optional ROI output. For ease of setup an auto-calibrate mode is provided that automatically sets the HV and amplifier gain to 1 keV/ channel using a Cs-137 source. Once the system is calibrated all parameters may be saved as setup files for quick recall of specific measurements. Data may be saved as binary files for reloading into memory or as spreadsheet compatible files for data processing. A background buffer is included for storing a spectrum when background subtraction, factional spectrum stripping or overlay is required. Multiple ROIs may be set with calculation of gross and net area. Presets include Real Time, Live Time and ROI Integral. Isomatch includes a text editable library of common isotopes. When loaded, markers are placed on the display at the positions of the isotope energies to aid in identification. Ordering information: Set includes Universal Computer Spectrometer with Windows 2000, XP, or System 7 & 8 Software - in 32-bit and 64-bit versions Software; Complete scintillation probe with SDA38 detector, stand, base and cables; Set of 8 gamma sources including "unknown"; Experimental Gamma Ray Spectroscopy manual on CD; and 6 USB cable.